It was audacious to propose a beer festival in January, a time of year plagued with post-Christmas tightening of strings and the Dryanuary initiative. 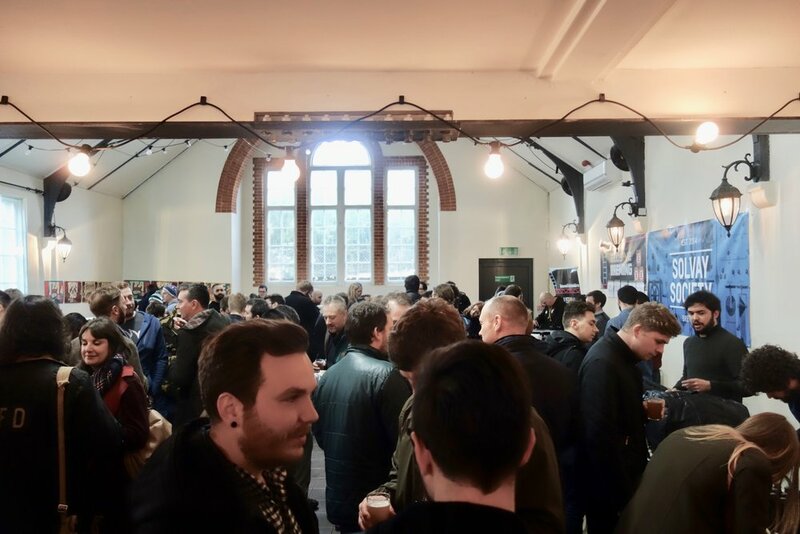 However, Stokey Beer Fest organiser Chris Martin proved the sceptics wrong and saw his event at capacity during both of its sessions on Saturday, the 21 January 2017. But he was on tenterhooks until the eleventh hour, as more than half of the tickets sold only days before the event. Incredibly, he found himself literally turning people away on the day due to its overwhelming success. Eight breweries were showcased alongside an on-site bottle shop provided by Mother Kelly’s and gin distiller Jensen’s for the spirit drinkers. For sustenance, Provisions were on hand, curating delicious plates of cheese, charcuterie and bread. As people streamed through the doors of Abney Hall in Stoke Newington on a bright Saturday afternoon, they were each given a festival glass and a stamp card for a 1/3 pint sample from each of the breweries. In addition to stalls, attendees were offered a 1/3rd of the Discontinued ESB, a beer brewed especially for the day following a series of Twitter polls to determine a style and recipe for this beer of the people. The hall was amply spacious for the scope of the event and queues for a drink rarely surpassed two people deep at the busiest of times. Brewers were on hand, happily mingling and talking visitors through their beers. For one of the breweries, Suffolk-based Little Earth Project, this was their inaugural festival experience. They were thrilled at the turn-out and the kudos received for their excellent sours. They specialise in mixed culture fermentation and their Brett Terroir had a beautiful delicate tart and funk notes, redolent of a bone-dry farmhouse cider. Ubrew, the open brewery based in Bermondsey arches, was selling their new canned beers. Two of the breweries - Brewage à Trois and Seven Sisters Brewery –also rely upon Ubrew’s facilities to brew their range, so there was a palpable sense of camaraderie in the hall. 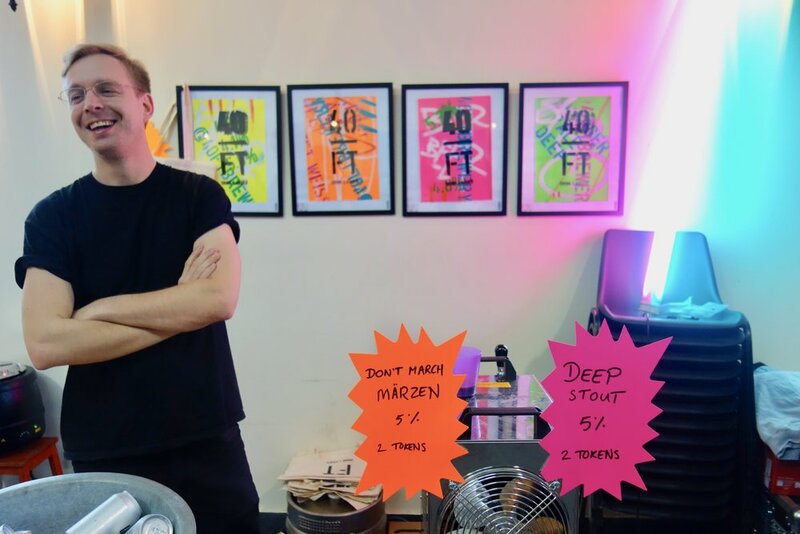 East London’s own 40 Ft Brewery and Howling Hops were serving up some enticing styles, including a Märzen from the former and a Double Chocolate Coffee Toffee Vanilla Milk Porter from the latter. The Solvay Society won drinkers over with a delicious dry-hopped sour that was available in both a standard and barrel-aged form; the depth and complexity of the barrel-aged version was beautifully tart and a personal highlight of the festival. Elusive Brewing was on my radar the one given the recent buzz around the brewery. Brewing on a 5BBL kit in Finchampstead, Berkshire, Andy Parker is the man behind the beer. Andy’s pedigree is inarguable, having won the title of National Homebrew Champion in 2014, and his beers have been receiving a lot of attention in recent months. The pixelated, retro gaming branding sees a Donkey Kong-esque barrel as the brewery emblem and some of the range of beers take their moniker from the same source, including a ‘Level Up’ series. The Sphere of Destiny (Mosaic) was on cask and quickly disappeared, but the Raspberry Ruin was perhaps the beer of the festival, a double raspberry imperial stout with copious hits of juicy tartness enveloped by deep, silky chocolate notes. The morning session had a great crowd of people with familiar faces and new, all opining on the more unusual beers, including the End of Thyme saison brewed with thyme and honey from Seven Sisters, which divided drinkers. The first hour was fairly tranquil, but crowds starting building quickly and at 3.30, beer writer Pete Brown hosted an informal session about styles of beer and beer tasting, guiding a group through several tasters. We remained until about 4pm, when the lull of a local pub with a seat beckoned. We felt that we'd sampled everything as intended and the crowds were beginning to thin out. In conjunction with Five Points Brewing Co, many pubs in the area were offering a £1 discount off their range, which we liberally made use of as we moved on from Abney Hall. If the evening session was as successful as the morning, then Stoke Newington might just have a new annual festival on its hands. It would be great to see more local breweries involved, so already the venue might need to be reassessed to allow for further growth. And Chris, the organiser? Well, he’s a maths teacher by day and juggled his job with curating the entire event, so he might need an extra few pairs of hands to see the festival become a regular event for the East London calendar. He might also consider a spring date next time, but then again, January seemed to work just fine for Stokey.